Monaghan boss Malachy O'Rourke has made two changes to his attack for Sunday's must-win Division One Football League game against Donegal at Castleblayney. Ryan McAnespie and Daniel McKenna replace Vinny Corey and Kieran Hughes, who struggled to make an impact in last weekend's Clones defeat by Kerry. Even a win may not be enough to prevent Monaghan from being relegated. Donegal are not themselves safe in Division One but a win is likely to earn them a semi-final place. 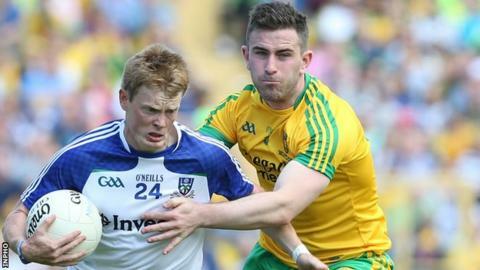 After two opening wins, Monaghan have lost their last four games to slide deep into relegation trouble while early Division One pacesetters Donegal go into the match on the back of three straight defeats. If Mayo, as expected, hand Down a seventh straight defeat at Castlebar and Cork avoid defeat against Kerry at Tralee, Monaghan will be relegated even if they beat Donegal. Matters are just as tight in Division Two with Cavan needing to avoid defeat by Galway at Breffni Park to secure promotion alongside Tyrone. Fermanagh need to beat the Red Hands at Enniskillen to be absolutely certain of avoiding the drop while Armagh may need a big win over Derry at the Athletic Grounds to retain their Division Two spot with bottom-placed Laois facing Meath in another big relegation clash at Portlaoise. Armagh will go down along with Meath if they both lose against Derry and Laois but a Fermanagh defeat plus wins for Armagh and Meath will see the Ernemen and Laois dropping to Division Three. Derry are not mathematically safe but anything other than a heavy defeat at the Athletic Grounds should be enough to keep Damian Barton's side in Division Two. Barton makes two change in personnel from the draw with Meath with Emmet Bradley and Niall Loughlin replacing Shane Heavron and Emmet McGuckin. A positional switch sees Mark Lynch moving from midfield to full-forward. Fermanagh showed tremendous battling qualities to earn a draw in Galway last weekend, in a result which did no favours to Armagh's chances of avoiding the drop. Niall Cassidy is suspended for Fermanagh after his dismissal against Galway so Marty O'Brien is drafted into the full-back. Pete McGrath has opted to make three other changes with the McCusker brothers Declan and Paul and Daniel Teague drafted in and Ryan McCluskey, Aidan Breen and Ruairi Corrigan making way. Armagh manager Kieran McGeeney has kept faith with the side which earned a battling draw against Tyrone last week after hitting an injury-time goal. Defender Ronan McNamee is in the Tyrone team for Sunday's Division Two clash with Fermanagh after recovering from an ankle injury. The full-back replaces Padraig Hampsey in one of four changes made by manager Mickey Harte from the side that started against Armagh last weekend. Mickey O'Neill replaces Niall Morgan as Harte continues rotating his keepers. Barry Tierney is preferred at wing-back to Niall Sludden while Padraig McNulty is in for the injured Peter Harte. Harte has been ruled out by the shoulder injury which forced him out after just five minutes of the drawn clash with the Orchard men at Healy Park. The Red Hands have already secured promotion and a place in the league final, but they will be looking to extend an 11-game unbeaten run. Already-promoted sides Antrim and Louth meet at Corrigan Park in a dress-rehearsal for the Division Four final which will take place on Saturday, 23 April. Monaghan: R Beggan; C Walshe, D Wylie, R Wylie; D Mone, F Kelly, K O'Connell; N McAdam, D Hughes; S Carey, D Malone, T Kerr; R McAnespie, D McKenna, C McManus. Subs: M Keogh, C Boyle, J McCarron, K Duffy, V Corey, D Clerkin, K Hughes, O Duffy, C McCarthy, B McGinn, F McGeough. Armagh: P Morrison; A Mallon, C Vernon, S Heffron; M Shields, S Connell, J McElroy; A Forker, E Rafferty; R Grugan, M McKenna, C O'Hanlon; C Watters, S Campbell, G McParland. Subs: M McNeice, S Sheridan, P Casey, M Murray, A Findon, R McCaughley, S Forker, N Grimley, T Kernan, N McConville, J Hall. Derry: T Mallon; O Duffy, C McKaigue, K McKaigue; G McKinless, B Rogers, D Heavron; C McAtamney, Emmet Bradley; B Heron, C Bradley, J Kielt; N Loughlin, M Lynch, SL McGoldrick. Tyrone: M O'Neill, A McCrory, R McNamee, C McCarron, B Tierney, R Brennan, T McCann, C Cavanagh, M Donnelly, P McNulty, R O'Neill, R Donnelly, D McCurry, S Cavanagh, C McAliskey. Fermanagh: C Snow; M Jones, C Cullen, M O'Brien; D McCusker, J McMahon, D Kelly; E Donnelly, B Mulrone; P McCusker, R Jones, R Lyons; D Teague, Sean Quigley, T Corrigan.